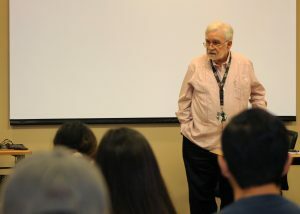 (HARLINGEN) – Born and raised in Cuba, Texas State Technical College Physics Instructor Jose A. Alvarez came to the United States in 1960 and is now sharing his immigration experiences through his writing during TSTC’s annual Humanities Week. That is why, when Alvarez was invited to be part of an author’s forum during Humanities Week, he felt compelled to accept and tell his story. Now settled at Rancho Viejo, the 75-year-old began teaching Physics at TSTC in 2011 and brought with him extensive experience in the telecommunications and physics fields. In 1965, Alvarez earned his bachelor’s degree in Electrical Engineering from the University of Detroit and went on to earn a master’s degree in Physics in 1967. Later, in 2002, he received a second master’s degree in management from Pace University in New York. “I was only supposed to come to the U.S. for college. I expected to return, but plans changed,” said Alvarez. Alvarez said he came to the U.S. alone, but when U.S. and Cuba broke diplomatic relations in the 60’s it became difficult to return to his island country. Eventually, his family settled in New Jersey in the late 1960’s, but by then Alvarez had established his life. Alvarez worked at AT&T as an internal consultant for technical issues and in management for most of his career. He also did independent contract work with start-up companies as a telecommunications contractor. His career and consultant work led him to countries as close as Mexico and Brazil and as far away as the Netherlands and Israel. “I loved my career. It took me all over the world, which sparked my love for travel,” said Alvarez. During one of his business trips to Mexico City, Alvarez met his wife who was from Matamoros, that’s when he decided it was time to settle in the Rio Grande Valley. At this time Alvarez had already begun writing. He wrote about his transition from Cuba to the U.S., his struggle returning home, his family’s struggle joining him in the states and his first trip back to Cuba in 2000. Though he enjoys writing his vignettes, Alvarez wanted to do more, so as a former algebra teacher, he decided to return to the classroom – which led him to TSTC. Alvarez said he enjoys getting paid for doing what he loves and said teaching, for him, is the most rewarding career. He hopes to one day turn the vignettes he shared with students during Humanities Week into a book, so he can continue telling his story for many years to come. For more information on TSTC and the programs offered, visit tstc.edu. This entry was posted in Harlingen on November 12, 2018 by Amanda Sotelo Sotelo.